Video has been on the rise for a while, offering marketers a proven way to grab strangers' attention and keep their target audience engaged. Live video streaming in particular has become increasingly popular as a tool for companies and groups to connect directly with their users, to gain greater product awareness, and to brand themselves creatively. In fact, just recently, the Content Marketing Institute predicted video -- specifically real-time platforms -- will be critical to brand growth in 2016. To learn more about how to take advantage of the live streaming boom, here are 11 creative ways to use products like Snapchat, Google Hangouts, Facebook Live, and Periscope to successfully market your business or group. 1) Raise awareness for a cause. The World Wildlife Foundation (WWF) paired with Snapchat to create the #LastSelfie campaign with the goal of raising awareness about endangered species. Using the slogan "Don't let this be my #LastSelfie," the non-profit suggested that just as images on Snapchat disappear within a short 10 seconds, these animals are vanishing from our Earth all too quickly. Users were then asked to share the snap, "adopt" an animal, and donate to the WWF through SMS. Within one week, the #LastSelfie campaign received 40,000 tweets, and was seen by roughly 50% of all active Twitter users. 2) Recruit interns and new hires. GrubHub saw potential in Snapchat early on as a way to get more interactive with a younger demographic. Rather than post an intern application on a standard career search site, or on less targeted channels like Facebook, Twitter, or LinkedIn, GrubHub asked its Snapchat followers to apply using the app itself. 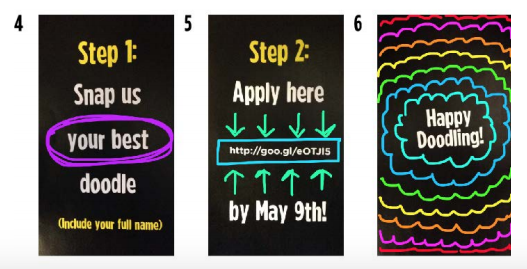 The doodle request was an easy way for the company to assess creativity and confidence, while also tapping into their ideal intern pool. 3) Coordinate with a popular event. Taco Bell managed to become one of the most followed brands on Snapchat by uploading a six-minute Snap Story "movie" in increments of 10 seconds. The short film focused on the launch of their product, the Doritos Locos Taco, but the company also took things a step further. Taco Bell coordinated their campaign to align with the MTV Movie Awards, making it relevant to the event and, therefore, gaining greater reach and brand awareness. Note: As of today (September 12th) Hangouts On Air will move from Google+ to YouTube Live. You can learn more about how to set up Hangout On Air with YouTube Live here. 4) Show off the job. NASA is big on Google Hangouts, hosting live videos as a way for space-interested audience members to learn more about the organization and its recent discoveries -- they've even held Hangouts from outer space. Recently, they teamed up with Verge Magazine to show off some perks and pitfalls of the astronaut job. Hangout participants used the hashtag #askAstro on their Twitter or Google+ to ask the NASA crew about life -- both personal and professional -- while aboard the craft, which were then answered in real time. The Hangout provided fascinating content, but also provided valuable information to those interested in that career path. 5) Get a bigger audience. In an effort to reach a larger audience, Manchester United used Google Hangouts to get a few more people on the "front row" during a match against Liverpool. Fans were asked to use the hashtag #MUFrontRow on their Google+ Page with a photo that showed off their team spirit. Of the entries, the best 22 were selected, and those fans were then projected onto the stadium's digital advertising board alongside the field. The campaign created more interest in the event, and seriously delighted some die-hard fans. Every month, IMPACT Branding & Design hosts a "Website Throwdown" featuring top marketing and design professionals. Participants are invited to submit their own website URLs to be broadcast during Facebook Live and constructively critiqued by that month's guest speaker. People can also tune in to watch, or help out by asking questions, posting comments, or reaching out on Twitter using the hashtag #WebsiteThrowdown during the live stream. The Website Throwdown is an awesome way to create brand awareness and authority by offering participants a chance to learn and improve. 7) Show off some skills. Tastemade does pretty much everything food, from recipe ideas to vlog tutorials -- they even hosts its own food show series. Part of what sets Tastemade apart from other food-focused publications, though, is the brand's really great content targeted to the everyday foodie. And, recently, Tastemade started exploring Facebook Live as a raw way to gain social traffic while also engaging with fans. 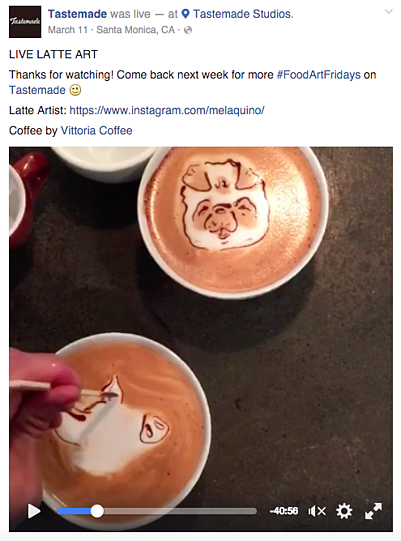 During a live latte art video, Tastemade asked viewers to submit requests as part of their #FoodArtFridays series. The interactive video received over 90,000 comments and nearly 5,000 shares. 8) Get fans and followers to laugh. Who doesn't love a good laugh? BuzzFeed decided to try out Facebook Live with a video purely for fans' entertainment. 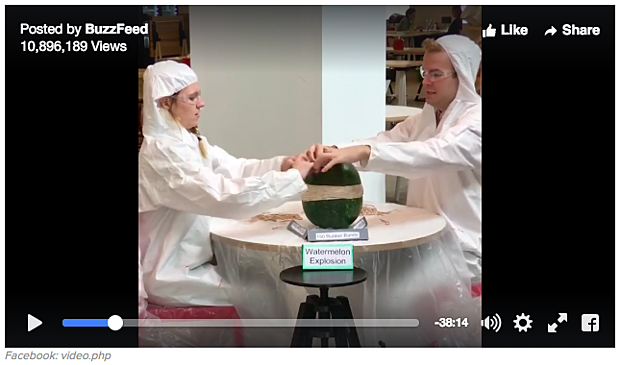 Two BuzzFeeders explored how many rubber bands it takes to explode a watermelon, which lasted about 45 minutes. According to Facebook, at the time, more people tuned in to watch the stream than any other live video on Facebook -- reaching over 800,000 viewers at its peak. Now, the video has over 10 million views, creating a ton of social and site traffic, just for doing something fun. CES is an annual event hosted by the Consumer Technology Association to showcase innovation technologies and products from across the world. During the 2016 event, Chevrolet debuted its newest car model, the 2017 Bolt EV. But rather than limit its audience to only those able to attend CES 2016, Chevrolet live streamed the announcement from its Facebook Page, giving all of the company's fans a chance to tune in and learn more about the product. Chevrolet also responded to Facebook comments in real time to keep its audience engaged with the video and answer any relevant questions. 10) Bring the audience along. 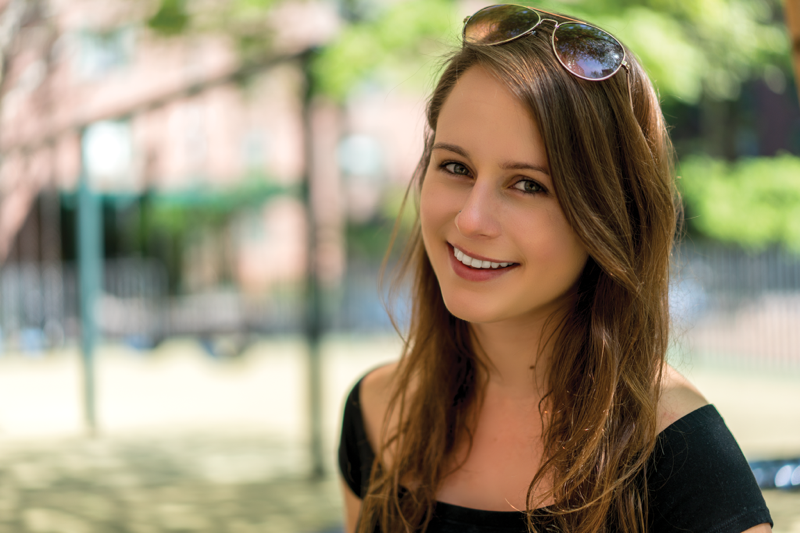 Last summer, Nestle partnered with online influencers to host live Periscope sessions of ways they were celebrating the first day of summer -- while eating Drumstick ice cream cones, of course. 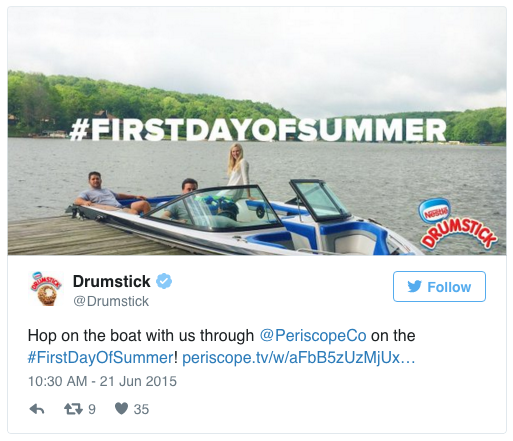 The company then promoted each activity on Drumstick's Twitter using the hashtag #FirstDayOfSummer for followers to tune in. Activities ranged from jumping on a ferris wheel, to biking on the beach, to eating ice cream by a fire pit. Nestle's campaign provided an opportunity for user engagement, helped associated Drumsticks with enjoying summer, and branded the company as lively and fun. 11) Go behind the scenes. General Electric used Periscope to launch a five-day live streaming campaign called #DRONEWEEK. GE enabled Periscope on a group of drones to give their audience a real-time, bird's eye view of their facilities, featuring not only some of their industrial machinery, but also interviews with GE scientists and tech experts. Fast Company called it the "Shark Week for science and social video nerds." GE managed to showcase five different facilities across the country, and even created a Twitter @GEDronePilot to provide extra commentary and interact with viewers. These are not the only live streaming platforms out there. Tons of applications and websites exist, and are used by millions of people every day. There's so much potential for brands and groups to use these outlets creatively to gain recognition, authority, and interest. How do you plan to use live streaming in your marketing? Share your ideas in the comments below.